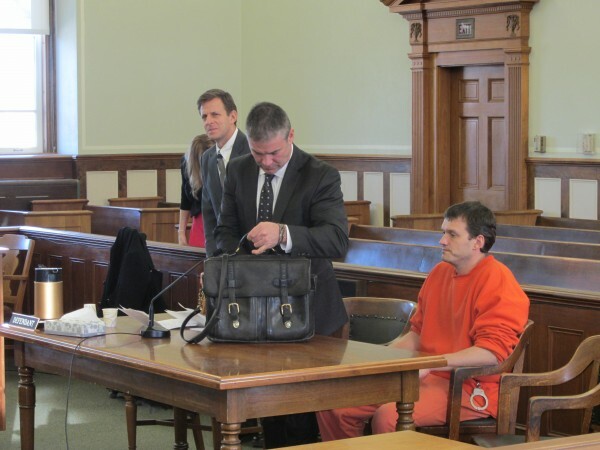 ROCKLAND, Maine — A former Maine State Prison inmate could serve nine more months behind bars for his role in the April 2009 beating death of another prisoner. John E. Thibeault, 34, pleaded no contest Thursday afternoon in Knox County Superior Court to aggravated assault. Assistant Attorney General Leane Zainea said a manslaughter charge against Thibeault would be dismissed with the aggravated assault charge replacing the more serious offense. Both Zainea and Thibeault’s attorneys said an agreement had been reached in which, if Justice Jeffrey Hjelm agrees, Thibeault will be sentenced to eight years in prison with all but nine months suspended. He will then be on probation for three years. The sentencing hearing is expected to be held next week. Thibeault was indicted in July 2011 for manslaughter in connection with the April 20, 2009, death of fellow prisoner Sheldon Weinstein, 64. Zainea gave a lengthy statement to Hjelm on Thursday, detailing what the prosecution’s case would have been if the aggravated assault charge had gone to trial. She said three prisoners would have testified that Thibeault and another inmate admitted that they had gone into Weinstein’s cell and struck him repeatedly in the head and on his torso. One prisoner would have testified that he saw Thibeault and the other inmate speak to a prison guard on duty before going into Weinstein’s cell. Thibeault and the alleged accomplice told another prisoner after the assault that they had received permission to “beat up the old guy,” according to Zainea. That witness also would have testified that he heard Weinstein screaming in his cell during the assault. Thibeault also told another prisoner that he had struck Weinstein with three to four body blows because Weinstein was in prison for sexually assaulting a child and “those people did not belong in this world,” Zainea said. After the assault, Weinstein was transferred to administrative segregation. He had been observed by a nurse on the day of the assault and no visible injuries other than a few bruises could be seen, the prosecutor said. But on April 24, four days after the assault, Weinstein was found dead in his cell. The state medical examiner’s office determined in an autopsy that Weinstein suffered a delayed rupture of his spleen. He also had rib fractures and bruising on his brain. The cause of death was determined to be blunt force trauma. No one else has been charged in connection with Weinstein’s death. At the time of his death, Weinstein — a diabetic — was serving a two-year sentence on a conviction for one count of gross sexual assault against a child. Because of a broken leg, he had been moved from the Maine Correctional Facility in Windham to the Maine State Prison in Warren eight days before the attack so he could receive more medical care. After an internal investigation into the attack by the prison, Corrections Officer Joshua Bailey was terminated and Sgt. William Robinson was demoted to correctional officer. The potential suit has been on hold pending completion of Thibeault’s criminal case. The prosecutor said Weinstein’s widow wants to attend the sentencing hearing. Defense attorney Philip Cohen said Thursday that Thibeault has not been named in any lawsuit but that the no contest plea was entered in the event that changes. A no contest plea results in a conviction but allows the defendant to avoid admitting guilt so he can challenge any subsequent civil lawsuits. Thibeault finished serving a 15-year sentence for robbery in September 2012 and was released after making bail on the manslaughter charge. He lived in Brewer for a while but was sent back to jail in early October 2013 after failing to attend a hearing on this case. On Thursday, attorney Jonathan Handelman represented Thibeault on the failure to appear charge. Thibeault pleaded guilty to that charge and was sentenced to three months in jail.